What Happens After a Healthcare Conference? What happens when a healthcare conference is over? Not all healthcare conferences are created equal. Some conferences leave a lasting impact with stories that will stay with you as a fellow human being and insights that will empower you professionally. Other conferences can be just fine, but without anything particularly eventful. Many months later you can clearly remember the impactful moments from the great conferences, while rarely remembering the program of the uneventful. What determines this outcome? Do some conferences just have to be more boring than others, or can the outcome be greatly enhanced by how we design conferences? Let’s take a look at some data. 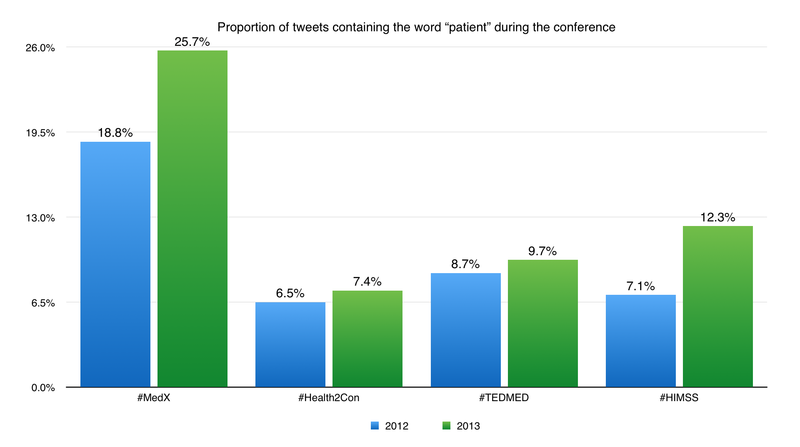 We previously wrote about how the nature of the healthcare conference audience has evolved over the past couple years. By analyzing the numbers from the over 1,900 healthcare conferences we are tracking, we’ve attempted to evaluate conferences based on what took place during them. But perhaps it’s just as valuable to look at what took place after the conferences. Can the impact of a conference be understood by looking at what happens after the event is over rather than during it? The large majority of healthcare conferences have major spikes in tweet activity during the conference days but then sadly completely flat-line shortly after it is all over, as illustrated in the graph below. There can be several causes of this flat-lining. One being the most obvious–Nothing amazing happened at the conference that was worth continuing the discussion. But even if there were much to be acknowledged and shared after the conference, there simply may not have been enough awareness regarding the conference’s hashtag. It’s plausible that some organizers are not doing a good enough job informing the audience about the hashtag and the discussions that are taking place in real-time on Twitter. Another culprit for organizers is the lack of engagement they foster both during the conference and after. Those who partake in the Twitter stream should be in a sense “heard” by being acknowledged and displayed in the physical conference space. There are several technologies that allow for this. What’s most painful to witness are conference organizers who themselves completely abandon their hashtag shortly after the conference. Building up a social community as one does during a conference is incredibly costly. Why let it die until next year’s event when sustaining it can be so rewarding? In contrast to the flat-lining of the majority of conferences, we see several that do a great job keeping the discussions alive. 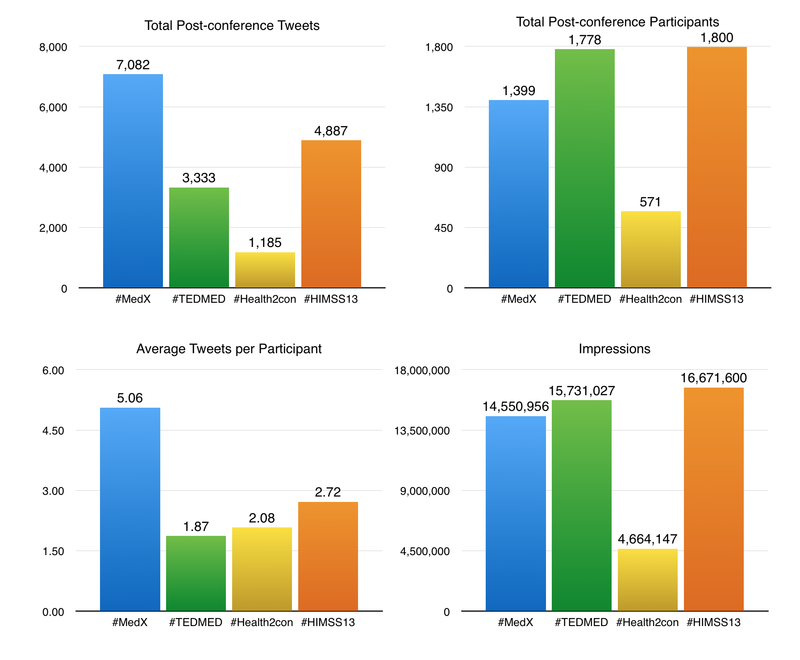 We took a close look at four U.S. conferences in the previous blogs, so we will also continue comparing #MedX #TEDMED #Health2Con #HIMSS13 here. We start with looking at the tweet activity during the 30 days after the conference and their logarithmic trend-lines. All four conferences do a great job compared to what we normally see. These are all impactful conferences that manage to sustain the conversations long after the event is over. 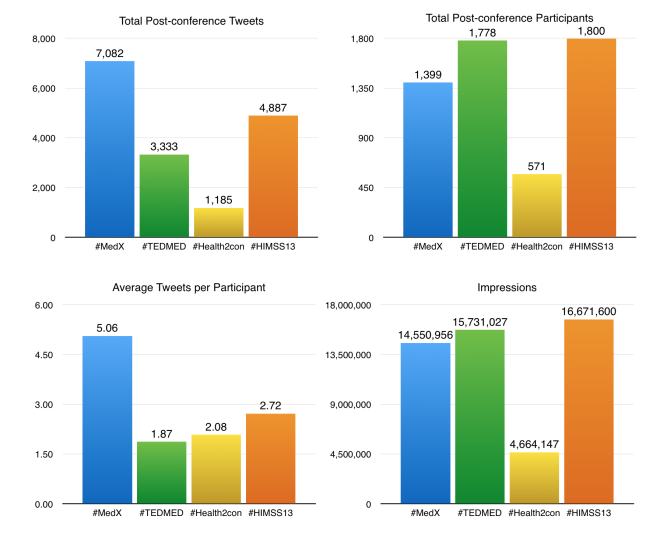 Looking at some common metrics, we see that #MedX stands out with over 7,000 tweets from close to 1,400 different participants during this post-conference period. Compared to the three others, it is seems that they managed to keep a high post-conference engagement with an average of 5 tweets per participant, which may indicate a level of conversation beyond the usual retweet and thank you messages. Let’s analyze the content of these post-conference conversations. In this graph we have highlighted the top 10 most commonly used words for each conference during this 30 day period. In some rudimentary fashion this highlights the topics of these discussions. It’s particularly interesting to see what topics #MedX’s community is discussing in order to attempt to understand why their engagement metrics are better performing. The word “patient” is central in the #MedX conversation, being the most frequently used word and with its plural version as number 10. If this is a clue to the performance then it is interesting to observe how the placement of the word “patient” correlates with the conference placement in the tweet activity graph (the higher ranking “patient”, the higher tweet activity). We expect the post-conference conversations to be largely colored by the conversations during the conferences. Finding this “patient” observation interesting, we looked further to see how patient-centric these conferences were even during the conference. Stanford University’s Medicine X conference is clearly the more patient-centric conference of these four, based on the analysis of the tweets collected during the conferences. Knowing how Medicine X operates, it seems then that those conferences that include patients not only in the audience and on stage, but also in the design of the conference itself should expect to be rewarded with a greater and stronger social discussion and community. This is not a research study with so few conferences considered, but the numbers presented are factual and our anecdotal observations seems to favor “Patients Included” conferences. 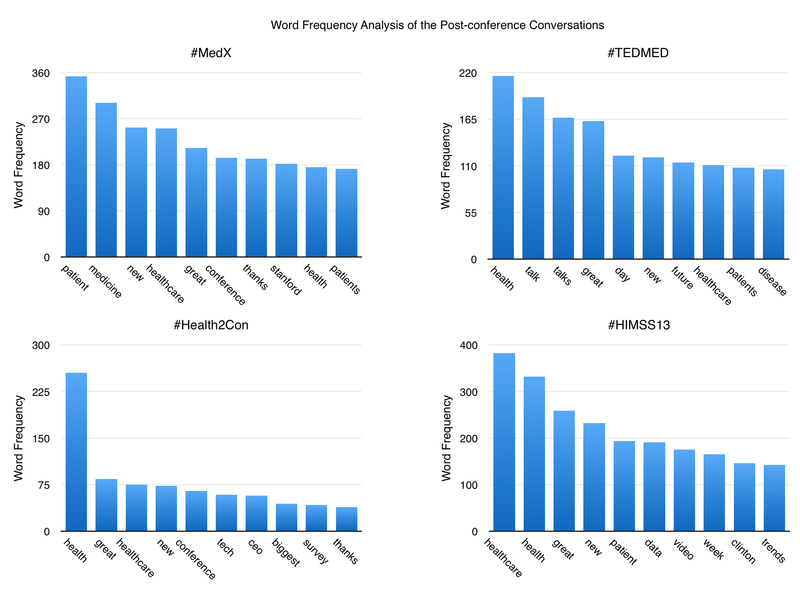 Focusing again on the post-conference tweet stream of #MedX. What kept their activity going? What was being shared? During this period, no less than 112 articles and blogs were published relating to #MedX. The conference organizers conveniently collected all these articles so that we could easily analyze their social impact. If similar lists of articles exist for the other conferences, we will be able to analyze those as well. Knowing the URL of each article, we are able to communicate with the APIs of Twitter, Facebook and LinkedIn to get the number of total tweets, shares, likes, comments, etc. for each article. The graph below shows the combined total for all these 112 URLs. Stories are powerful. They get our attention, they get shared and they go viral. It should perhaps be no surprise that when you include patients in your conference, you get more stories–Stories that engage us and compel us to share it with those close to us. And those close to us happen to be followers on Twitter and friends on Facebook. No one has better stories that we need to hear than patients. Conferences with their sponsors, presenters and attendees will benefit from including these stories.